37 LISTS Very Cute Puppy DogsAdorable and hilarious puppies and dog pals to look at while you are supposed to be doing other things. List Rules Vote up for your favorite dog shaming photo! We love our fuzzy animal friends, but sometimes they really make a mess of things! No matter how many times they ruin our carpet or destroy our favorite pair of shoes, we still love them more than anything. Here we've gathered an adorable collection of dog shaming pictures that demonstrate the the fact that everybody makes mistakes, even man's best friend. The furry little perpetrators you'll find here come in a vast array of breeds, shapes, and sizes. Despite their differences however, they all have one thing in common: they've been bad, and their owners are putting them on blast. Here you'll find a hilarious collection of canine crimes, pictured alongside the reaction of those who have just committed them. 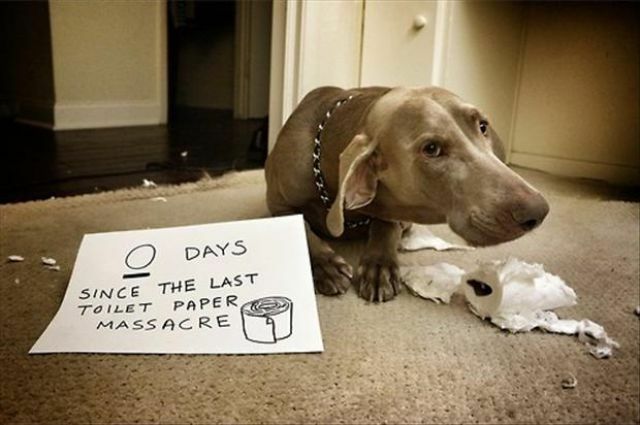 While some of the dog shaming pics you'll see here depict petulant pooches, others feature those who regret nothing. While the shame is evident on some of these cute, little guilt-ridden faces, others still remain blissfully unaware that the paper detailing their deeds could be anything but a certificate of achievement. After all, what helpful pooch would suspect that mom could feel anything but gratitude to find that recently-puked vomit spot licked spotlessly clean? What homeowner wouldn't be thrilled to return home to discover that their well-mannered dog had been nothing but gracious to the mysterious masked visitors who just left with the new flat screen? Whether they're shrouded in guilt, shameless, or just clueless, one thing is for sure: these adorable dogs are sure to keep you grinning as they pose for some of the best dog shaming photos the Internet has to offer! It's Not Like Humans Need Toilet Paper... Right?